I recently had the opportunity to teach a classed entitled “Fairy Tales”, to a group of 5 and six-year-old extremely creative girls. What an amazing experience! A favorite project was the “butterfly book”, a single signature book of folded bright tagboard bound together with plastic cord easily strung through punched holes. and metallic tape, the young artists transformed their books into unique butterflies of beauty and whimsy. They mastered tools that required a bit of manual dexterity and control, such as stamps. and some added plenty of plenty of “gems”. The above is an envelope accordion book, but the butterfly theme rules! Space, Time, Focus and Support. 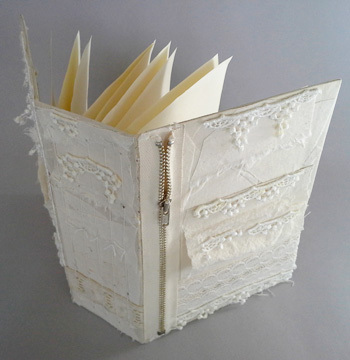 Picturing Bookmaking…the work of our hands. Saying goodbye to summer 2016 “Wonderland: The Book Makers’ Studio. Cherish the memories! Until next year…walk in peace, and make books…read them too! A Picture Poem giving new meaning to hand work…handiwork…the work (play?) of our hands! These students HANDle the form well! 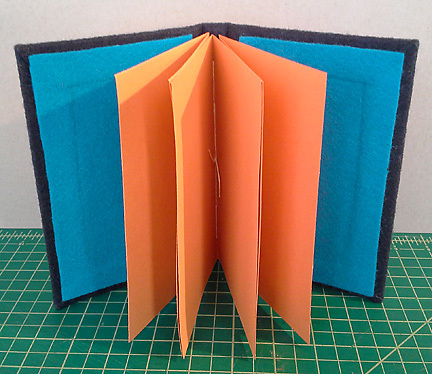 Five weeks of bookmaking with students aged 5-10. An incredible opportunity to witness and nurture creativity in action! Taking an existing book and altering it. Some students had no problem cutting right into the book…(a paperback)…and others were more hesitant. Some students think of books primarily as a space for their many writing ideas…. and others are focused on the visual, enchanted my the material possibilities. Re-purposing tags as flags in the flag book. The purple tee-shirted bookmaking sistahs! Concentration. Beginning to write after creating a glittering border. Book End (table end) inspiration. Handmade Portfolios using hanging file folders and shoelaces. Portfolio, and the joy of glittery stickers. Our piece of heaven: the supplies table. Working in a single signature book. Why use one pencil when you can use three?! Creating scrolls…an ancient book form. We added wooden dowels later. Thank you for visiting our summer wonderland: The Book Makers’ Studio. You can always create your won…with whatever you have on hand to create with! It can be fascinating, fun…and sometimes startling to add elements to books that compel, or at least encourage engagement by giving the viewer, or, “handler”, (peruser?) something to do. Books by their nature are most often opened and closed…but in what other ways can they move, or be moved? This humble structure is informed by the Japanese concept of “Wabi-sabi“, an aesthetic of imperfection, impermanence, and even incompleteness. 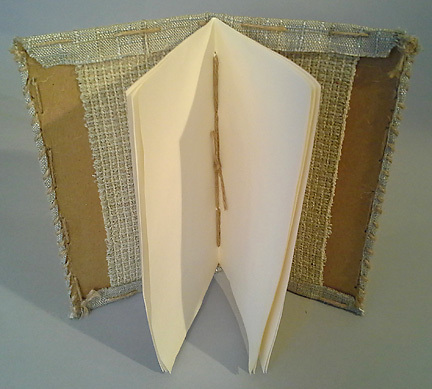 Repurposed cloth is sewn to thin, repurposed cardboard with jute cord, with other strips glued on inside. Repurposed paper passed to me by a colleague is sewn with jute to the cardboard spine in a single signature with a five-hole pamphlet stitch, to create the pages. 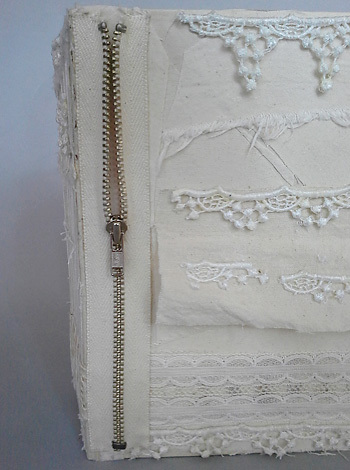 Inspired by the cheesecake box from which it’s covers and spine are made, this piece was covered first in hand-me-down newsprint strips, then repurposed muslin fragments, then appliquéd (in the strict sense of the term) with repurposed lace and a zipper. 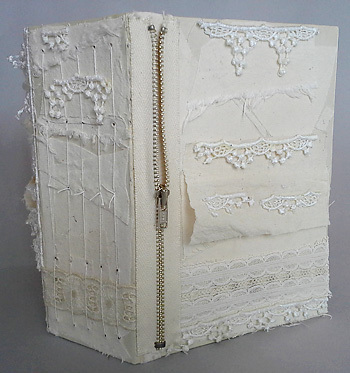 It’s pages are five single folded sheet signatures, or bifolium , sewn to the spine with unwaxed linen thread. 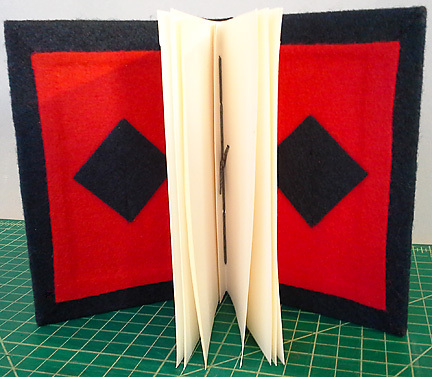 This multiple signature (technically “section“) book is made from repurposed cardboard, acid-free drawing paper, hemp cord, a zipper, and Eco-fi felt. The signatures technically bifolium, are sewn onto a strip of the “felt”, which is then centered and glued over the spine. 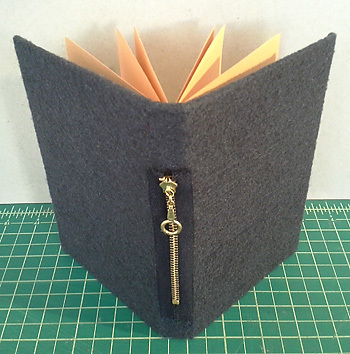 The book is covered, or “wrapped” in Eco-fi felt, which is used to decorative effect, and gives it a “cozy” feel. 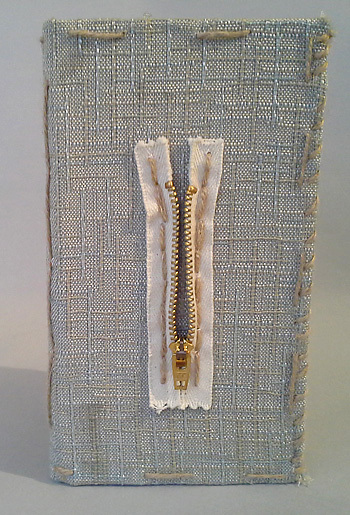 The zipper is glued to the spine. 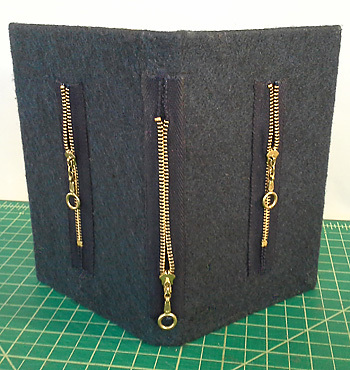 This book is constructed in the same way as the one above, except that the pages are created from a single signature, and three zippers are applied, making sound effects when engaged. Participation encouraged. Books are made to interact with.